Maggie provides a non-judgmental and empathetic environment for her clients to address problems, discover inner strengths, and feel empowered to better cope with challenges and make meaningful changes in their lives. She has worked with individuals, groups, families, and couples struggling with a variety of issues including mood and anxiety disorders, trauma, addiction, grief and loss, domestic violence and abuse, LGBTQ issues, obsessive-compulsive disorder, dissociative and psychotic disorders, life transitions, low self-esteem, and relationship and work issues. Maggie integrates humanistic, cognitive-behavioral (CBT), mindfulness, expressive arts, and insight-driven approaches to help her clients. Above all, she believes that the therapeutic relationship itself is the most important part of counseling. 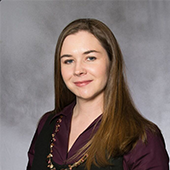 Maggie holds a Master of Arts in clinical mental health counseling from the University of San Diego and a Bachelor of Architecture from the University of Notre Dame. What is My Mind Doing Now?